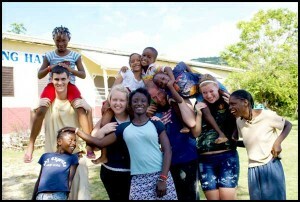 Rachel Hunt (left center), her husband, Josh (right center), and other members of the Jamaica mission team and friends. Rachel (Reed) Hunt loves kids and they love her, too. And now, for the fourth time, the 2003 graduate of Cedar Springs High School has taken that love, along with a team of Cornerstone University students, and shared that love with deaf children in Jamaica. Hunt graduated from Cornerstone University in 2008 with a BA in Accounting, and with an MBA in 2011. She is also staff accountant at the university. She was in her senior year (2008) at Cornerstone when she heard there was a mission trip forming for Jamaica, in conjunction with Jamaica Link Ministries, based in Grand Rapids. She joined the team and handled their finances on the trip. 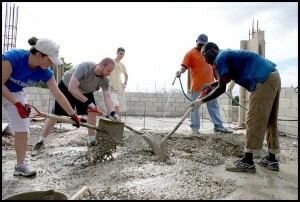 The small mission team stayed at Fairhaven Ministries, and worked at the Jamaica Christian School for the Deaf for 10 days, redoing their library. “We stripped it down, catalogued books, set them up by genre, set up the computer and scanners, made it like a real library,” recalled Rachel. They also played with the kids at the school during downtime, did devotions at public schools, and visited an orphanage for the severely disabled. Team members help mix cement for addition. After the first trip, she was hooked. In 2009 she went with a team to Mexico, but in 2010 she co-led the next trip to Jamaica, and then headed up the trips in May 2011 and January 2012. Each time they’ve worked with the Jamaica School for the Deaf and Robin’s Nest orphanage. Rachel said the goal was to foster a relationship and build connections with the children and people there. “A lot of teams go to the school for a day and then are gone,” she explained. “So when a team comes and stays, they get very excited. Some of the kids recognized me as soon as I got there,” she said of her most recent trip. In 2010, Rachel and the team helped with construction on the school’s kindergarten building, by filling in the foundation, and mixing and pouring cement for the ceiling. Last spring they bought windows for the entire kindergarten building and helped with painting. On the most recent trip, they helped with the addition of a second floor to the kindergarten building by mixing and filling cinder blocks with cement. “We helped them get ready for the bigger teams that will be going there this summer,” she said. 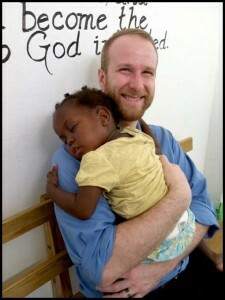 Josh Hunt holds a sleeping Jamaican child. It was Josh’s first mission trip. “I liked that it was an opportunity to connect with another culture, and that we were invited to work and help them,” said Josh. He also expressed an interest in going back. The group did have some down time. After working they played with the children, and had their own bonding times as a group in the evening, playing cards, board games, uploading their daily blog, and sometimes swimming in the ocean, which was right across the street. They also saw some of the sights and visited the marketplace. Rachel said one of the neatest things is to see what some of the students that were on the team in the past are now doing because of their experience. “We had one guy lead a trip from his church to Jamaica, and a girl who went on the trip in the spring and this month is going back to Jamaica this summer to live and help out at the Jamaica Christian School for the Deaf. Another went on the trip to see if she liked being out of the country, and then went to Korea for a semester to study. For those who think they might want to be a missionary, it’s a good way to see what it’s like,” she said. Rachel said that her goal is to continue the trips, and build on the relationships they’ve established with the people. But she’s confident that can continue with others, if for some reason she can’t go in the future. She said the trips are sometimes open to others, and if other organizations are interested, they can also contact Jamaica Link at www.jamaicalink.org to set up their own trip. For more info on Jamaica Christian School for the Deaf, visit www.jcsdeaf.org, and for Cornerstone University, visit www.cornerstone.edu.